The very latest news and views from Ability! Our signed accounts can be downloaded here. All this and more in your customer newsletter. For the first time, we have combined our reports to customers and stakeholders into one document. We gave a warm welcome our new CEO Jeff Skipp who is determined to continue advancing Ability Housing’s standards. Our latest business Annual Report, ‘Focusing on ability, not disability’, looks back on a year of challenges and achievements. We reaffirmed our commitment to an independent future, opened new supported living developments and took on new care and support contracts. We also prepared to say goodbye to David Williams, who has successfully led the organisation as our CEO for the past 14 years. This is our latest report to customers. It gives an overview of the year’s activities including the areas where customers have taken a leading role and worked with us to improve services, the Q-Team in action, new schemes and much more. The latest news and views from Ability! what Cavell House meant to Geraldine. Harnessing positive values and behaviours. Our latest Business Annual Report provides details about our activities, developments, events and progress over the last financial year. This is our latest report to customers. It gives an overview of the year’s activities including the areas where customers have taken a leading role and worked with us to improve services. The is the latest edition of our customer newsletter. This is our report to our customers. It gives an update on our activities during the year and sets out how well Ability has been performing. Our latest Business Annual Report provides details about our activities, developments, events and progress over the last financial year. This is our customer newsletter. This is our report to customers for the 2011-12 financial year. It gives an update on our activities during the year and sets out how well Ability has been performing. 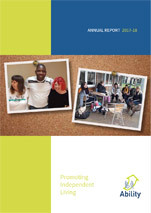 Our Business Annual Report for 2011-12 provides details about our activities, developments, events and progress.